Fremont Street is often seen as the "other side of Vegas". The main strip on Las Vegas Boulevard is often the only place visitors go and don't dare to venture outside of it. But what little people know is that Fremont Street is the site of the original "strip" where all the top casinos in Vegas once stood before the expansion in the mid 1980's that saw newer, swankier hotels opening up along Las Vegas Boulevard. 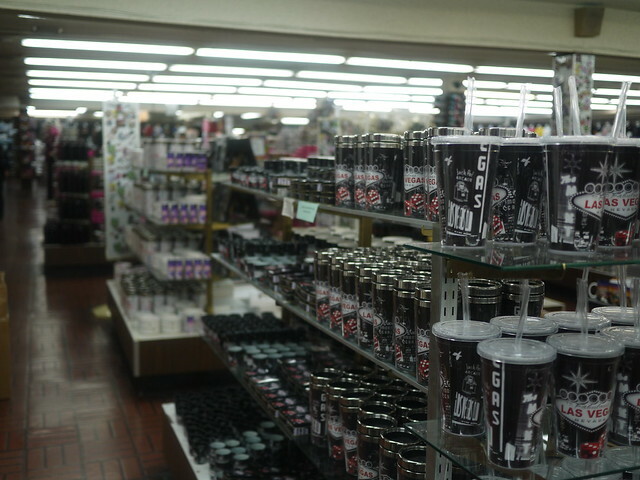 Before arriving in Fremont street, we started with a visit to the Bonanza Gift &amp; Souvenir Shop. This landmark is known world over as the "World's Largest Gift Shop" with over 40,000 square feet of shopping space. Inside you'll find everything from cheesy Vegas snow globes, postcards and playing cards to some unique offerings like Dias de Los Muertos skeleton figurines, religious icons plastered on burlap purses and miles and miles of plastic flip-flops. You might walk out with nothing, but it is an attraction all in itself. We picked up a few knick knacks and went on our way! Having worked up an appetite on our drive over to Vegas, &nbsp;before we arrived in Fremont &nbsp;we stopped off at the infamous Peppermill Restaurant after a recommendation from my friend at work. I WAS BLOWN AWAY! This place is a retro-lovers dream and could only be a place you'd find in Vegas. The restaurant and lounge is one of those places that seems so retro, you'd swear Hugh Hefner would be sitting in the lounge, smoking a cigar and swirling a colourful drink in front of the fireplace (and yes, indeed there is a fireplace in the lounge at the Peppermill). When you walk into the Peppermill you step into sensory overload. Bright purple lights almost blind you and blue velvet carpets and walls get you feeling cozy. 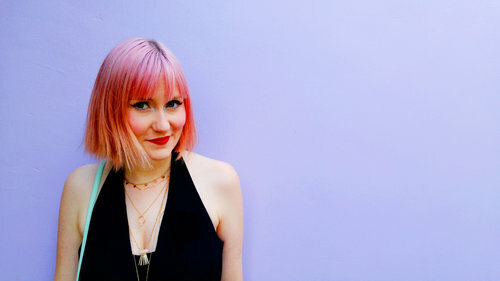 There are pink flamingo stained glass lamp shades, a giant cherry blossom tree growing out of the middle of the restaurant and tropical napkins scattered on every table. There are GIANT fishbowl drinks as colourful as the decor and the smell of the food in the kitchen makes your stomach growl. Even the sugar in the dispenser is multicoloured! We ordered a traditional ruben sandwich and onions rings and a retro french dip. They both were perfectly delicious. Just the right amount of grease which is necessary to produce a good diner meal without being over whelming. The cocktails were all beyond fabulous and the friendly servers made the entire experience all the better. Along the way to Fremont Street, we stopped off at the Little White Chapel. 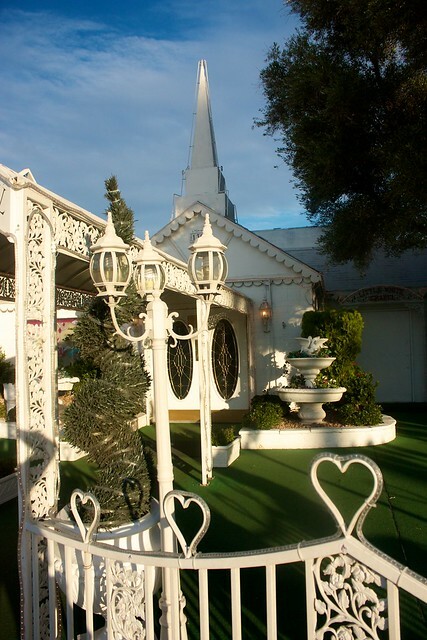 This darling, little building covered in hearts and white painted wrought iron filagree, has been the site to over 800,000 quickie weddings since it was built in 1951. 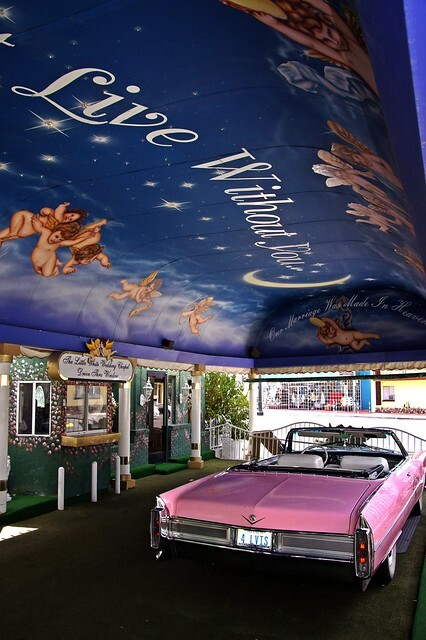 It is open 24 hours a day and even has a drive-thru tunnel of "vows" where couples can be wed without leaving their vehicle. It is a charming little place and I adore the intentionally tacky aesthetic. Although it might never be a place where I could see myself getting married, it certainly is a fun place to people watch. We arrived in Vegas and pulled into the parking lot of the Golden Nugget Casino and Hotel. 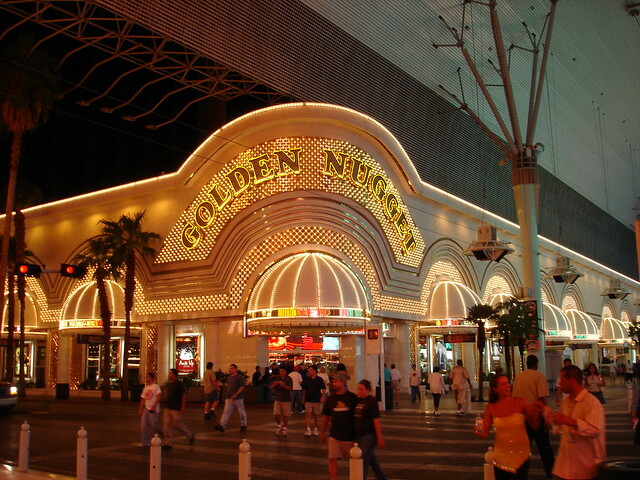 The Golden Nugget was originally built in 1946, making it one of the oldest casinos in the city. This monolith of white arches and golden lights is like the White House of Nevada. All things seemed to start with the Golden Nugget and so many hotels and casinos attempted to replicate it's gravitas over the years. When we arrived, Dan learned that his credit cards had been compromised but we found a payphone and while he chatting with customer service I went to make reservations for dinner and grab a coffee. After a while everything was sorted and we headed up to our room! This place is brimming with history and is also one of the beautiful hotels on the strip. Staying here you can find deals for as low at $60/night without compromising style. Most of the rooms have been lovingly renovated and there is even the new Rush Tower full of modern rooms with touches of old-vegas ambiance which is where we chose to stay. Last time we were in Vegas we didn't have much of a view but this time we had an awesome view of the retro Casino's that backed on the Golden Nugget. Our room was fantastic and HUGE! We had a great soaker tub, flatscreen tv and even a couch! Before heading out for dinner we stopped in at the swimming pool area called the TANK. There we can either swim (or as we did since it was pretty cool) just sit back and admire the the three-story shark tank filled with an array of other sea creatures! There was a few fire pits burning and we grabbed a few cocktail and sat by the fire enjoying the view. There are many choice for steak dinners on Fremont, each one boasting their own specialties and seemingly impossible low prices. 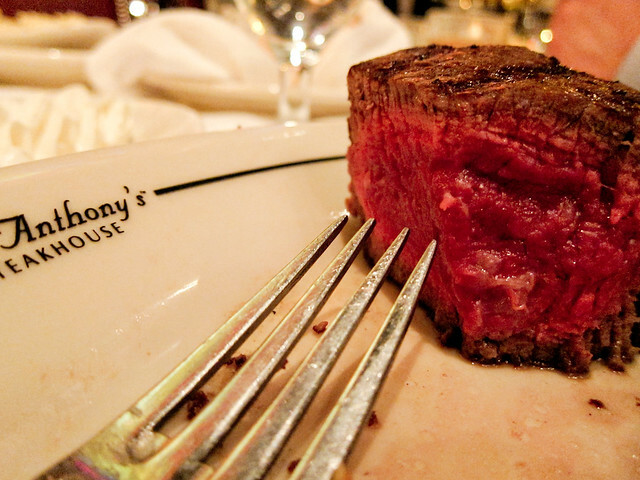 But, I think there is only one *real* choice of where to go when you're in town and that is Vic And Anthony's Steakhouse. Labelled as one of the best steakhouses in the USA, this place will never disappoint on upscale Vegas atmosphere and phenomenal dining. 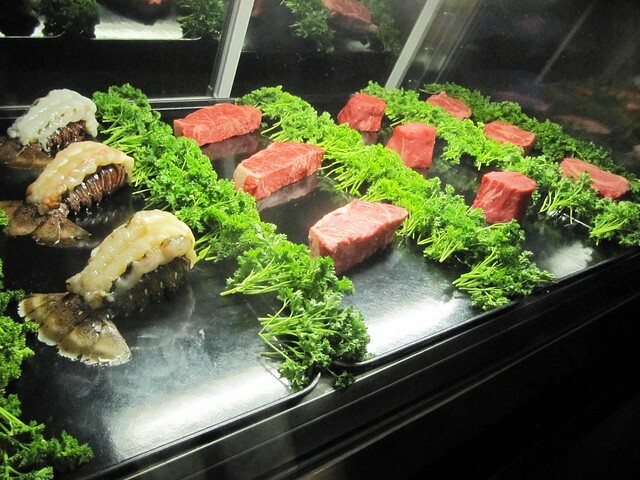 When you walk in the doors at Vic and Anthony's you'll be a greeted by a charming hostess and a glass cabinet filled with premium cuts of steak and freshly caught lobster tails. You can pursue the selection and decide before you even sit down, which of these babies will be your dinner tonight. We managed to score a great deal by asking about the prix fix menu called the "Distinctive Dining Deal" that offers up an appetizers, a main course, a side dish and a dessert for only $49.95 a person! This deal is unreal since a single steak itself could run you that much without. There is no skimping on the sizes that you'll be served either with this prix fix. We both got the Lobster Bisque finished with Cognac to start and also paired two 8 oz. Filet Mignon with some different sides. I got the Au Gratin Potatoes and Dan ordered the Haricot Vert. This was one of the best meals of my life, hands down. The steak was almost creamy it was so moist and the sides were rich and flavourful! By the time dessert arrived we were so full but couldn't say no to Crème Brulee. After all this rich and filling food, we thought it was time to walk some of it off. And the best place to do that is along the Fremont Street canopy. We were be mesmerized by the light show that appears on the electronic roof of this canopy every 30 minutes. The Viva Vision light show was installed in 1995, is 1,500 feet long and 90 feet wide. The 6 minute show that twinkles and shines above you runs every hour beginning at dusk and ending at midnight. There are over 12.5 million energy-efficient LED lamps along with state of the art sound that displays the show featuring musical acts such as The Who, Bon Jovi and more. After the light show, we checked out any of the amazing musical acts that are set up at various stops along the street. It was close to Halloween so most of these acts were all dressed up and themed for Halloween. They wore outlandish outfits and sang some great spooky tunes. Even the stages were all made up for the holiday season. We grabbed a few cheap drinks from the Four Queens, we took some time to a look up at the wonderfully restored Vegas Vic Cowboy and Sassy Sally Cowgirl (renamed Glitter Gulch when it was bought by Mermaids casino in 1980). These signs were originally the first two neon landmarks to guide visitors into Fremont at the street's first intersection. 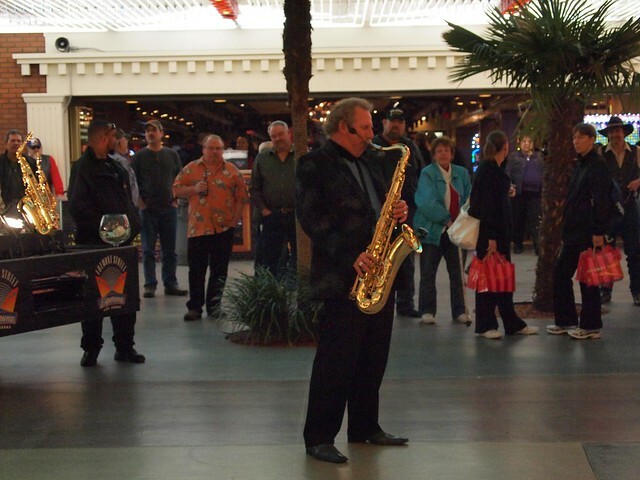 One of the more, unlikely acts that is surprisingly amazing is the Saxophone player that is set up outside the Golden Nugget Casino. He draws in huge crowds and just like last time, got us dancing in the street. Although these cheesy souvenir shops seem like the last place in the world we might want to visit, there do offer up once great resource. $1.00 beers! We grabbed some cheap brews to take with us and then headed down on Fremont Street East. Fremont East is outside of the canopy and pedestrian mall. It is a more hip and trendy area where you'll find unique bars and some of the best neon in town. The Las Vegas Neon Museum has been raising money and working with the city to restore some of their historic and aw-inspiring Neon signs from years past. Thought to be only good for scrap metal and left to rot, these iconic signs have been restored by the museum and are now up on display in this "urban gallery" called Fremont Street East. We saw on our walk the Silver Slipper Casino sign. Originally on display in 1950 outside the Golden Slipped casino it now stands in it's full glory at the gates of Fremont East. We also saw the Hacienda Horse and Rocker which was built in 1967 and stood at the Hacienda Hotel on Las Vegas Boulevard South. We had plans to check out the different bars in the area but unfortunately, by being there on a Monday, we found out that most of these places were shut. But we still had a good time sipping on our beers and watching the neon lights of the city. We stopped in the cool El Cortez hotel and Casino and played a few games before heading in for the night. Staying on Fremont Street is certainly a different experience than on the main strip but certainly one I'd love to do again - this time perhaps on a weekend when all the great bars is the east end are open and full of life. NEXT TIME!